This post describes the time I spent in Bulgaria from 12 to 17 Sep 2016 after the 32nd Mountain Running World Championships. Before taking the bus back to the Sofia airport on Mon 12 Sep, five guys (Dougal from NZ, Kris, Mark, Shaun, Matt) ran up to three of the seven lakes in the Rila Mountains above the race finish. Run time was 2 hrs but total time was 4 hrs. Very enjoyable and beautiful place (one of the must-see areas of Bulgaria). We were all pretty weak from the race. At 2 pm, we boarded a bus destined for Sofia airport. I rented a car and Kris, Shaun and I drove to Nesebar on the Black Sea Coast. It took about 4 hrs and we arrived around 9:30 pm. I booked a place called Cherno More Apartment (top 2 floors of building). It cost only 117 BGN ($90 CAD) for two nights! Really nice fully furnished place. We were all super impressed. We ran, swam in the Black Sea twice, and checked out Old Nesebar. The sand on the beach was incredible. It was fine white sand that was so hot you could barely walk on it (almost like putting your feet in the oven). The water felt as warm as a swimming pool and tasted very salty. It was quiet, sunny and peaceful. No rushing, just chill. Staying in the same apartment two nights was a good idea. Around noon Wed 14 Sep, we drove to Burgas and walked out onto a long pier. Really nice place. We then drove to Sofia, which took about 3.5 hrs (400km). Speed limit on interstate/"Trans-Bulgaria" highway is 140kph in the left lane but most ppl drive around 120 to 130 kph. Great idea to have a speed limit of 140 kph. Roads were amazing; probably the best roads I have ever driven on! A number of athletes I talked to and everything I read said that the roads in Bulgaria were horrendous and that you absolutely do not want to rent a car. They said not to drive at night because there are purportedly open manhole covers with no signage that you might drive over and damage your vehicle. I was a little psyched out and considered just staying in Sofia for the final week. Based on my limited experience (6 days and 1,000+ km of driving), these claims are completely false and I am EXTREMELY GLAD that I did not follow their advice. In my experience driving in Bulgaria, the roads were amazing (the best roads I have ever driven on) and the drivers were just as good if not better than Canadian drivers. I highly highly highly recommend renting a car even though it can be quite expensive, it will allow you to see 100x more and go where everyone does not go and see the true character of Bulgaria. I saw over 50 billboards next to the road and almost all of them were empty. I dropped Kris and Shaun off at the Sofia airport on Wed evening and then drove to Borovets, which is close to the start of the highest mountain in Bulgaria (Musala Peak). I drove through the pitch black night countryside (no street lamps and not much reflective paint or road decals) relying 100% on the car GPS. It was A LOT of fun driving down winding narrow roads. On Thurs 15 Sep, I ran 1,575m up Musala Peak (2,925m ASL), the highest mountain in Bulgaria (and also the highest mountain in the entire Balkan Peninsula). It took 1:40 to get up and 2:47 total run time. Extremely good run! Euphoric. Perfect weather and trail conditions. The trail was well used and very runnable. I think I may prefer Bulgaria over Austria, Switzerland, and Germany; Bulgaria has the Black Sea AND mountains (albeit not as high) AND Bulgaria is much less expensive. 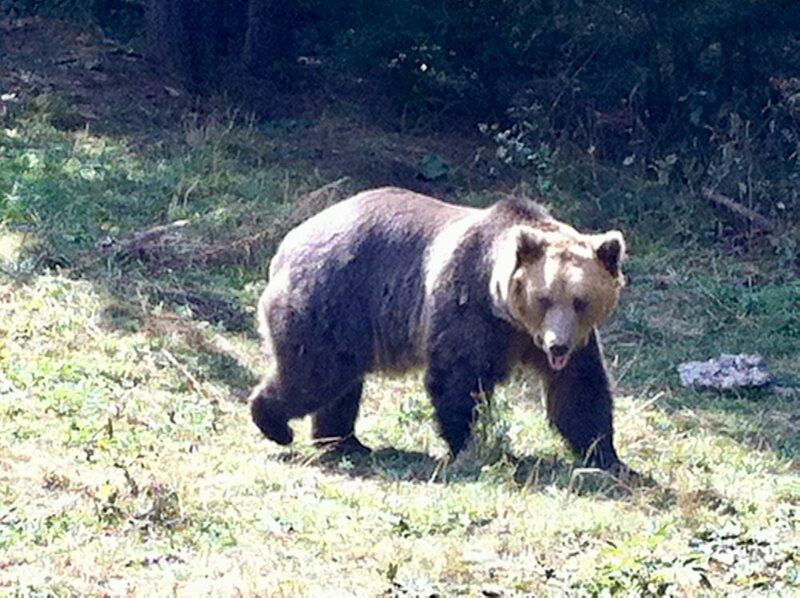 In the late afternoon, I drove to Bansko because I wanted to see the Dancing Bear sanctuary. While I was in Bansko, I happened to find out about a nearby peak called Vihren Peak, which is the second highest mountain in Bulgaria. On Fri 16 Sep am, I woke up at 6:30 am and drove to Vihren Hut (kind of cheating but I didn't want the run to take too long as the bear sanctuary opened at 10 am and I also wanted to run up Vitosha Mountain near Sofia on Fri pm/evening). Elevation gain was 964m up from Vihren Hit to Vihren Peak (2,914m ASL, second highest mountain in Bulgaria). It took 0:53 and 1:21 was the total run time. Beautiful mountain and run conditions. I said “dobre dain” (good day) to everyone I passed. Often, people would start talking to me in Bulgaria and then my cover was blown as I only know about two words of Bulgarian. I met a gentleman on the way down who told me that when he was younger he would run up Vihren like me (he was hiking up that day). He was 80 years old and said this would be the last time that he was going to hike up Vihren. Respect! On Fri 16 Sep pm, I took a drive “back in time” on the way to Belitsa (near where bear sanctuary is). There were horse drawn wagons, horses were pulling farm tools in the fields, and there was horse droppings on the amazingly paved single track road. There were also people smoothing logs with hand tools and the locals were wearing traditional clothing (like you would see for a festival) for their everyday lives. It was a beautiful drive through the Bulgarian countryside on a winding road (super smooth with trees that bent over the road to form a natural tree arch) and didn’t see a single other vehicle. There was some construction going on in Belitsa so I had to take a few detours over very rough short sections of road and through very narrow alleyways (roads). When I arrived at the Bear Sanctuary there was only one other car in the parking lot. The Bear Sanctuary was very good and entry only cost 6 lev ($4.50 CAD) including a guided tour (in Bulgarian and English). There were 26 brown bears there. A couple bears were blind (they said it was from their cruel owners giving them alcohol) and one had only three legs because it got in a fight with another bear and it had to be amputated. Since the young bears were taken from their parents at a young age and kept in captivity their entire lives, they would not know how to survive in the wild. Many of the bears also had they claws cut off. The guide said there are 600-700 bears in the wild in Bulgaria (thankfully I didn’t see any bears on any mountain runs). The sanctuary was created in 2000. The guides who worked there were very friendly and their English was easy to understand. On Fri 16 Sep evening, I drove 2 hours from Belitsa to Vitosha District in Sofia where the hotel was. It was a really nice area of town. The gentleman working at the hotel said it would take 5 hours one-way just to get to the top of Cherni Vrah on Vitosha Mountain. Being the competitive person that I am, I decided to challenge him on it. I started running at 5 pm and ran 1,800m up Vitosha Mountain (Cherni Vrah - Black Peak). On the way there I passed several deserted old communist looking huts/buildings (Call of Duty 3 style). It looked a bit like the set from a horror film “Wrong Turn”. The trail was beautiful and well maintained. I purchased a map of Vitosha Mountain and almost everything was in Bulgarian (signage and map) so matching up the symbols (Cyrillic text) seemed to make sense. Ran to the top in about 1:55 and the total run time was about 3:30. Distance was about 28km round trip. On the way down, a random (fast) runner ran up behind me and we ran together for a couple of km. I think he was chasing the light like I was as the pace was pretty quick. There was an amazing line of striped yellow/black posts placed every 50m all the way up to the top from the edge of the trees with a trail right next to it. When I got to the forest, I noticed that it was so dark that I could not see my hand in front of my face (and the trail was very bouldery). Since I didn’t want to twist an ankle by myself (the other runner took a completely different path down Vitosha), I used the iPhone’s flashlight (37% battery). I was not sure how long the battery would last and how long it would take to run down the forest trail so I had to run as fast as I could with this dim light down a rubbly trail. Although this may seem trivial, it could have turned into a serious situation. 1. The most important and useful piece of advice I can give you is to RENT A CAR, RENT A CAR, RENT A CAR! Although it is relatively expensive, you will see 100x the country and get a true feel of what the real country is actually like. Leave the busy city and experience the smaller mountain towns, coastal towns and countryside; this is where the true character of the country is. When someone tells me that they have visited Canada but have only gone to Toronto, they have not really seen Canada. The same is true for other countries. Having a car gives you flexibility and it gives you a secure location to store your baggage/valuables. Time is money. You will not waste your time waiting for buses or trains (trying to understand a schedule written in a foreign language). You just spent thousands of dollars getting to the other side of the world, don’t skimp out on a few hundred dollars now. 3. Do some planning BEFORE you leave. You don’t want to be wasting time while you are there. Make a list of 10 things that you would like to see (you don’t have to see them all) but note the top three that you definitely want to see and the rest are extra. These are some of the things I wanted to do: swim in the Black Sea, Run Musala Peak, run Cherni Vrah (Black Peak) on Vitosha Mountain, go windsurfing on Black Sea (Extreme Windsurfing in Nessebar, didn’t happen as the winds were calm), see Old Town of Nesebar and see the Dancing Bear Sanctuary in Belitsa. 4. Bring only ONE small carry-on backpack total. I makes things A LOT easier, makes you more flexible, eliminates the possibility of the airline losing your luggage and makes the trip a lot smoother. You can wash your clothes half way through the trip. With a small bag, your trip in your destination country starts as soon as you get off the airplane and you don’t have to lug your heavy luggage back to your accommodation before starting your trip. It is also cheaper as the airline does not rip you off on checked baggage fees. 1. Yield signs/Right of Way Signs (yellow diamond with a white border). Thanks to Adele Blais for explaining this sign to me. Instead of just having a standard yellow triangular yield sign like we have in North America, there are anti-yield/priority signs in Bulgaria that tell the drivers that have the right of way. I also like how many traffic lights in Bulgaria have countdown timers next to the traffic lights that tell drivers how long they have before the light turns red/green. I like the way the light goes from red->yellow->green (like in England), which I feel is more efficient than in North America where it goes straight from red->green. 2. Some places I visited in the countryside were very old-fashioned. On the way to the Bear Sanctuary near Belitsa, I saw horses plowing fields, people manually debranching logs (smoothing the sides) with hand tools, there was horse manure on the road from the horses, people were dressed in traditional clothing (and no, there was no special festival going on). It was as if I have stepped 50 years back in time. 5. Language and alphabet are different. I found it quite challenging to understand Bulgarian words and text although Benoit Gignac told me that it is easy to translate once you have the translation key. It was very challenging to communicate with middle age to older Bulgarians. Generally, they would get their sons/daughters who would then be able to speak to me in broken English. Most of the time it was like playing charades. Unlike French (or even German who share the same letters as English) where many of the words are the same, at times it was extremely challenging to understand a single word of what the other was saying. 6. Speed limit in left lane on major highways is 140 kph but most people drive around 120 kph. Having this speed limit makes a lot of sense although fuel economy seems to suffer. 7. Showers – In most places, the shower and washroom are one so when you take a shower, the water sprays everywhere in the washroom (on the toilet, the sink the mirror, etc – put the toilet paper outside the washroom before you shower). Everything is tile including the floor and walls (no carpet in the washroom like some places in England). I did not see one shower curtain in Bulgaria. Can someone explain this, please? 1. Plan things a little more BEFORE getting there. Leading up to the Worlds I was/am very busy getting my private pilot licence so spent very little (if any) time planning the trip to Bulgaria figuring that I would do it once I got there. Internet turned out to be nearly non-existent so when we eventually got internet, we were planning instead of swimming in the Black Sea or running on the beach. 2. Car GPS - Very nice (important in a country where you don’t speak or read the language) but very expensive. In future, maybe buy a sim card with data and use the maps on the device. 3. Rental Car Insurance - Be careful with rental car insurance. In Canada, I use the insurance provided with my credit card. However, I was leary about using the credit card rental car insurance in Bulgaria even though I read through the fine print terms and conditions. I was apprehensive about not using the rental car insurance offered by the rental car company (because I was psyched out/told how horrible the roads and drivers apparently were in Bulgaria). If something was to happen, I had a feeling that the non-Bulgarian speaking foreigner might be the first one to be at fault. I wanted to avoid this (not that having insurance prevents anything from happening). I ended up renting the car on Expedia and checking the box to buy rental car insurance. Then I got an email from a third party insurance company (not even the actual rental car company like I was lead to believe) saying that I now have insurance. I arrived at Hertz and they told me that I don’t have car insurance with them but then I said that I do have insurance. That was a big waste of money and I would recommend confirming with your credit card company before you leave Canada. See this document about renting a car in Europe 2016. It is reasonably useful. If you would like me to expand on anything or if you have any questions, please feel free to contact me via email or Facebook.